I can’t believe that May is here already! Plans are well under way to broadcast this year’s International Dawn Chorus Day sounds from Cley Marshes in Norfolk on Sunday 7 May. I’ll have a number of microphones set up on the Norfolk Wildlife Trust reserve and the plan is to broadcast live online between 4.15 and 6.15. Sunrise is officially at 5.12. 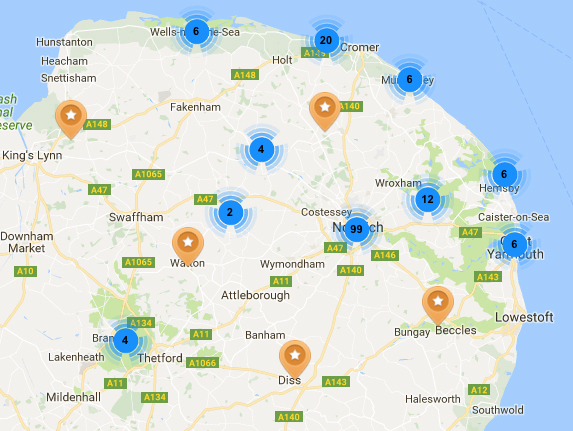 You can use the link below to hear the broadcast live – or if you want a lie-in then the whole two hours will be on the Norfolk Sound Map later on Sunday. Part of the broadcast will also be relaid by SoundCamp / REVEIL, which follows the dawn round the world. This year I’m working with a project called Sounding Coastal Change. Sounding Coastal Change is an Open University and University of Dundee research project about coastal change – social and environmental – in North Norfolk. The idea is to use sound, music and different ways of listening to explore the ways in which the coast is changing, and how peoples’ lives are changing with it. The project is funded by the Arts and Humanities Research Council of the UK and supported by the National Trust. This broadcast has been made possible by the generous help of the Norfolk Wildlife Trust. If you are wondering what you are likely to hear, then the wonderful volunteers at the Cley Visitor Centre have kindly supplied me with a list!